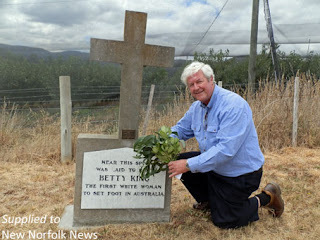 Reg Watson places a bush posy on the grave of Betty King. HISTORIAN and author Reg Watson visited New Norfolk earlier this week to place a tribute on a significant grave at the Back River Chapel. The grave is that of Betty King, believed to be the first white woman to set foot in Australia. "To commemorate Australia Day I took a trip to the Back River church cemetery just outside New Norfolk to do my part in remembering this remarkable woman," Mr Watson said. Betty Thackery arrived on the First Fleet as a convict in 1788 and the story goes that she was the first woman to step ashore. From Sydney was sent to Norfolk Island where she met a marine, Samuel King. Both were ultimately transferred to Hobart Town where they were married and settled at Back River on a property which is still called "King's Rocks". "I have no doubt she was indeed the first to step ashore on that fateful day, before all the other women including the officer's wives," said Mr Watson. "Having Betty King buried in southern Tasmania is a big asset and much more should be made of it," he said. Hobart on August 7, 1856. Betty King has another distinction. It is believed she was the last First Fleet woman to die, in 1856, aged 93. Her husband died six years earlier, aged 86.